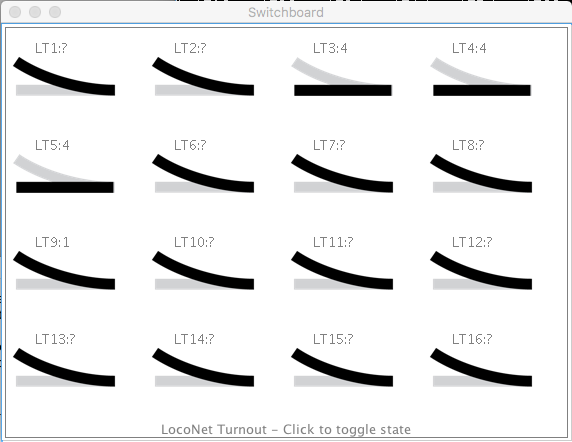 A default pane with switches for Turnouts in the range 1 - 24 opens. If any Turnouts were defined in JMRI beforehand, those switches will immediately show their current state and let you control them. Auto Address Range (selected by default)since 4.13.4 makes it easy to use the left/right arrows on the pane to jump to the next set of hardware addresses while keeping the number of items on the board the same. 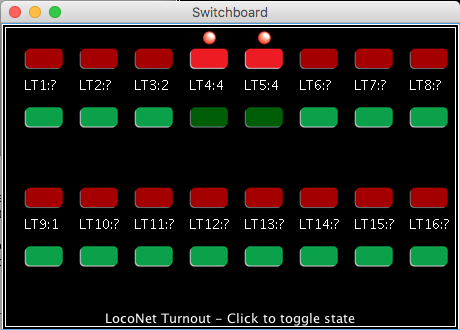 Optionally, change the background color for this Switchboard via the Options menu. To use the new settings, click [Update Switchboard] to replace all current items on the board. Note that hybrid Switchboards containing more than one bean type or connection are not saved to disk. You can create and save separate Switchboards for different connections, address ranges and object types like Turnouts. 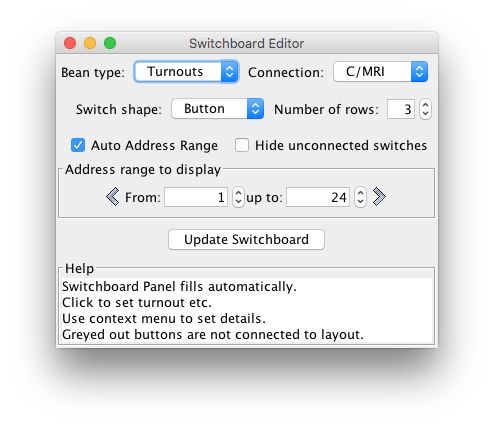 Change the name of this Switchboard by choosing Rename Switchboard... from the Edit menu while the Editor is open. When ready, close the Editor by clicking the Close box in its title bar or Close Editor from the File menu. Open the Editor at any time from the Switchboard's Edit menu. Clicking on an active switch on the board will send an instruction to the layout to toggle the item (on/off, closed/thrown). Depending on the hardware, the switch on the board will change to show the new state. A tooltip appears when you hover your mouse over a switch, showing the user name of that item (if it's connected and set). Remember to save your setup and configured items by choosing Store Panels... from the File menu. You can have your Switchboards open automatically upon startup by setting them as as a Startup Action under Preferences > Startup.